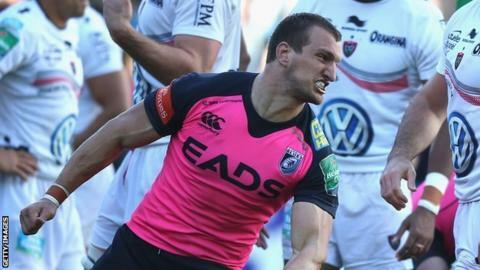 Wales captain and Cardiff Blues star Sam Warburton could join the nation's player exodus. The open-side's contract expires this summer and amid uncertainty over the future of Welsh domestic rugby, he wants his playing future settled. Blues are among the four over the sport's future. Warburton wants a deal to stay in Wales secured by Wednesday, 11 December. But if he leaves, the 2013 British and Irish Lions captain, would join a host of Welsh stars in exile, at a leading French or English club. Reports have linked Blues, Ospreys, Scarlets and Newport Gwent Dragons with a bid to join England's Aviva Premiership. The 12 leading English clubs have argued for changes to the governance, finances and entry qualification for Europe's top tier Heineken Cup. But the Welsh, Scottish, Irish, Italian and French governing bodies are against relinquishing their joint running of European competitions, that are largely administered by them via European Rugby Cup Ltd.
That has led to England's clubs opting out of any competitions run by European Rugby Cup Ltd after the end of this season. The instability created by the impasse over Europe's future has helped create financial uncertainty for Wales' professional teams. Gloucester boss Nigel Davies, former Wales captain and coach, has condemned what he views as the "shocking apathy" over the player exodus that Warburton could join. Of the 15 Welshmen who were named in the original 2013 British and Irish Lions tour party to Australia, six either are or will be playing for teams in France and England next season. Three current Wales internationals have this season committed to new contracts - Blues' wing Alex Cuthbert, Ospreys fly-half Dan Biggar (not selected for the Lions) and Dragons number eight Toby Faletau. Five more experienced Welsh Lions are out of contract at the end of the season - Leigh Halfpenny, Warburton (both Blues), Hibbard, Adam Jones and, Alun Wyn Jones (all Ospreys). Warburton's fellow British and Irish Lion Richard Hibbard could join Gloucester in the off-season. Scarlets' Wales fly-half Rhys Priestland and centre Scott Williams have also been linked with moves away from Wales. The region are losing Wales Lions centre Jonathan Davies to Clermont Auvergne, while Ospreys, Wales and Lions lock Ian Evans is going to Toulon. In addition Welsh international fly-half James Hook and lock Luke Charteris are at Perpignan, while prop Paul James plays for Bath.